Best-known for his work in the Tim Burton Batman movies, Michael Keaton visits seemingly autobiographical territory in 2014’s Birdman: Or (The Unexpected Virtue of Ignorance). Once upon a time, Riggan Thomson (Keaton) achieved massive success as a winged superhero named “Birdman”. However, Riggan left the franchise in the early 1990s and soon fell into “washed-up” territory. As part of a hoped-for comeback, Riggan stars in a Broadway adaptation of Raymond Carver’s What We Talk About When We Talk About Love. However, many snags occur, some related to castmembers such as talented but volatile co-star Mike Shiner (Edward Norton). Riggan’s personal life also interferes with his progress. His much younger girlfriend – and co-star – Laura Aulburn (Andrea Riseborough) may be pregnant with Riggan’s child, and his adult daughter Samantha (Emma Stone) acts as his assistant after her stint in rehab. Add to that the possibility Riggan may be experiencing hallucinations and a mental breakdown and he goes through a number of trials on his way to opening night. I’m old enough to remember Keaton as a young comic sensation, so the notion of him as an old has-been – whether in real-life or as a role – depresses me. That said, I feel happy that he earned a career renewal with Birdman, as I like Keaton enough to want to see him return to prominence. Unfortunately, I don’t think his performance in Birdman really merits all the positive attention it received. While Keaton seems perfectly competent, he always comes across as though he’s consciously “acting”. Some of this seems appropriate, as the movie offers something of a meta commentary on the showbiz scene, but I still think Keaton’s turn here seems overly “thought-out” and not natural. His Riggan comes across more as a conceit than as a person. It probably doesn’t help that many of Keaton’s co-stars outclass him. In particular, Norton offers splendid work as the uber-method Mike. Virtually all of Birdman’s best scenes run through Norton, as he ranges from arrogant to obnoxious to venal to earnest, all while we wonder what reality exists in Mike. He’s a stage performer who spends so much time in character that he only comes alive in public, and Norton brings him out well. Despite the talented cast, one wouldn’t really call Birdman an “actor’s movie”, as it embraces a flashy visual sensibility that threatens to overwhelm all else. Scratch that – the visuals do overwhelm everything about Birdman, as the techniques selected by director Alejandro G. Iñárritu dominates the experience. Most notably, Iñárritu chooses to edit the film in a manner that creates the impression everything we see progresses without any cuts. In a technical sense, this works surprisingly well, as Iñárritu manages to obscure those edits in a deft manner; we can discern the transitions if we want, but they don’t stand out and become a distraction. That said, the lack of obvious edits seems like an unnecessary gimmick. Although we may not overtly notice the cuts, we do feel conscious of their absence. I don’t think these choices benefit the story in any significant way; instead, the absence of clear edits seems gimmicky and self-conscious. This contributes to my main problem with Birdman: it feels like the proverbial triumph of style over substance. While it wants to comment on society and its characters, the film seems so wrapped up in its visual conceits and tricky narrative choices that it falls short of those goals. Because of this, Birdman turns into a fairly enjoyable experience but not an especially rich or memorable one. While it keeps us with it, the movie doesn’t endure once it ends. We find some brisk entertainment but not much more than that. A somewhat shallow satire, the film flirts with dimensionality that it never attains. Birdman: Or (The Unexpected Virtue of Ignorance) appears in an aspect ratio of approximately 1.85:1 on this Blu-ray Disc. At all times, the movie looked excellent. Sharpness remained terrific. Virtually no softness materialized during this tight, accurate presentation. 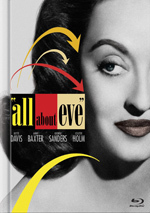 No jaggies or shimmering marred the movie, and edge haloes remained absent. Print flaws also failed to show up here. In terms of colors, Birdman opted for stylized hues that varied from scene to scene. This meant some heavy blues, reds and greens, but in general, the film opted for either teal or amber. Within those choices, the tones seemed appropriate and distinctive. Blacks were deep and tight, and low-light shots showed good clarity. This turned into a totally satisfying image. I also felt pleased with the surprisingly dynamic DTS-HD MA 5.1 soundtrack of Birdman. Given the story’s character orientation, I didn’t expect much from the soundscape, but it managed to use the various channels in an involving way. A few scenes used the speakers in an obvious manner, such as a big fantasy action sequence; as anticipated, that one boasted a lot of punch. However, the more “day-to-day” segments seemed even more impressive due to the specificity of the audio placement. Take an early bit where Riggan heard a sound from his computer; the mix located this sound between the front and rear so well that it made me think it really did come from my basement wall. Along with a score that popped up all around the room, this was a broad, engaging soundfield. In addition, audio pleased. Music was bold and dynamic, while effects seemed lively and accurate, with good clarity and power. Speech remained natural and concise. This ended up as a more than satisfactory soundtrack. Because my rental Blu-ray of Birdman comes with no extras, I can’t comment on their quality. I can mention their existence, though. 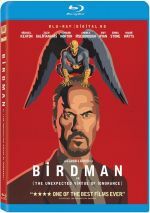 The retail Birdman comes with a featurette entitled All Access (33:28) as well as A Conversation with Michael Keaton and Alejandro G. Iñárritu (14:03). Finally, it throws in a Gallery with 41 still photos taken on the set. Due to its victory as Oscar’s Best Picture, Birdman: Or (The Unexpected Virtue of Ignorance) possesses a place in film history, but I don’t think it really deserves it. While the movie remains interesting enough, it feels more like sizzle than steak and seems unlikely to be remembered as a classic down the road. 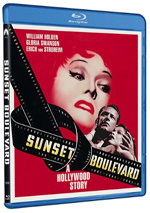 The Blu-ray offers excellent picture and solid audio as well as a moderate set of supplements. I think Birdman provides decent entertainment but it lacks the substance it needs to achieve greatness.